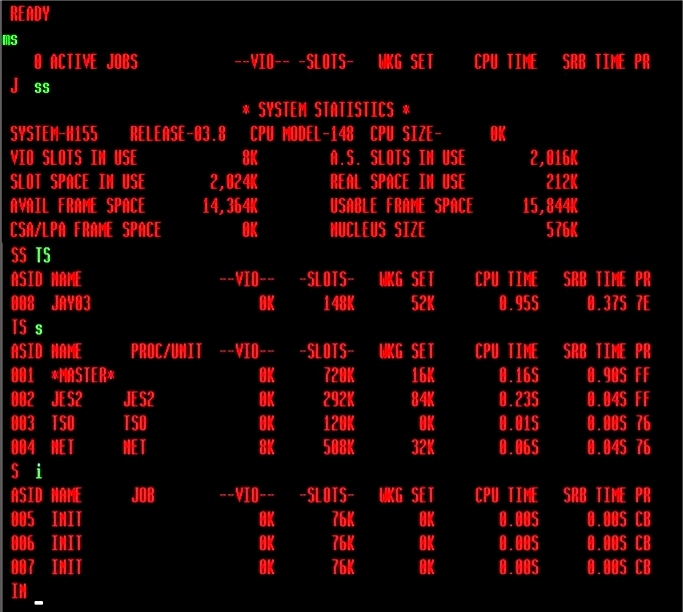 The MS (Master Summary) TSO command displays various MVS System Information through the use of subcommands (System Statistics, Link Pack Information, TSO statistics, System Initiators, and information on executing Jobs, Started Tasks and TSO users). The source for this was the SHARE MVS GROUP Modification tape, version 80-007 from July 28, 1980; specifically from the embedded Los Angeles MVS Users Group tapes contained at files #48 through #55. I see that the version of this tape available from CBT at this time no longer contains these files, so I am glad that I have an earlier version of the tape available. The load module for the command is built from three CSECTs (MS, JOBS, and USERS) contained on file #53; the help member is found in file #49, and a required macro is from file #51. I have combined the installation JCL, the assembler source (plus the required additional macro), and the help file into a single jobstream to install the command. The resulting jobstream - $ms.jcl - is contained in the archive ms.tgz [MD5: 033ea506cc2909391691a31466eb4727]. Download the archive and extract the jobstream (WinZip on Windows/?? or tar on Linux). Submit the jobstream to assemble and link the single load module for MS into SYS2.CMDLIB and copy the help text into SYS2.HELP. If you don't have SYS2.CMDLIB defined, you will need to modify the jobstream to specify a different target load library. Also if you do not have SYS2.HELP defined, you may modify the jobstream to place the help information into SYS1.HELP. Both target libraries are identified with the tag '< == TARGET' near the end of the jobstream. THERE ARE NO OPERANDS FOR THE MS COMMAND. THE SS SUBCOMMAND DISPLAYS SYSTEM STATISTICS. THE LP SUBCOMMAND DISPLAYS LINK PACK INFORMATION. THE TS COMMAND DISPLAYS TSO STATISTICS. THE I SUBCOMMAND DISPLAYS INITIATORS. THE J SUBCOMMAND DISPLAYS JOBS. THE S COMMAND DISPLAYS STARTED TASKS. THE T SUBCOMMAND DISPLAYS A COUNT OF THE NUMBER OF TSO USERS. THE E COMMAND EXITS FROM MS.